Welcome guest poster, Jakob Barry, who writes for Networx.com. When you come across an ant, roach, or silverfish in your home you probably stop in your tracks for a brief moment before deciding how to proceed. Should you ignore it, go for the kill, or capture and toss it outside? Stink bugs are one of those types of insects that are best taken alive and removed from the house immediately. A true nuisance to the homeowner they get their name from the unpleasant odorous substance they secrete in self defense, though dead ones can also clear a room if stepped on. Never Kill Stink Bug. Ewww. When the summer is over and cooler weather is nearing these little critters with the shield-like back search for warmer enclaves to ride out the winter, specifically in your home. Seeking refuge they will hit upon any nook and cranny that fit’s their slightly awkward shape and once inside it’s usually very hard to get rid of them. If you find one in your humble abode don’t hesitate to scoop it up in a cup or similar type of vessel and dispose of it elsewhere but try not to grab it with your hands because although they aren’t looking for a fight they are known to give a little pinching bite. Anna, here. I grab them with a tea towel and then throw them outside. I found that if I throw them outside from a door on the south side of the house, another one magically appears. They love the warmth of the sun. Now I resort to throw them out a door on the north side where it isn’t sunny. Also, make sure you actually get the bugger off your towel. They don’t go quietly with a little shake. Would you want to be banished to the cold? Vacuum cleaners have also become useful tools for catching them but do this at the risk of the vacuum suffering a smelly fate. Make sure there are screens on the doors and windows of your home. If screens are ripped patch them up. Check for cracks around window and door frames. This is one of the prime locations where stink bugs will enter your home. Cracks can occur from the house settling or water damage from the previous season. The best way to seal them is with caulk. Anna, here. Sliding glass doors are a stink bug’s best friend. If they can get in, so can air infiltration. Read here, here, and here on how to winterize your home. You know I am the Queen of anti-air infiltration. Check around door thresholds. They are usually secure but may have developed cracks around the edges like window and door frames. Again, use caulk to seal them. Check for cracks in the attic. This is best accomplished during the day when sun light can easily be seen poking through any holes in the roof or along the gutter line. For better results try turning off the lights and pulling down the shades on any windows. Survey cracks in siding including wood shingles (also known as wood siding). If holes exist these bugs will move in and gladly wait it out storm after storm. Check ground level windows to make sure they are sealed. Stink bugs could take advantage of the warmth from the furnace, enter the cellar, and hibernate under the basement flooring. Remove big leafy vegetation close to the home’s foundation because it’s just what they like to eat. That way the stink bug won’t burrow into an unsuspecting crack somewhere after a nice breakfast or dinner and fall a sleep for the winter. Finally, if you believe there is an infestation in your home fighting it will be a challenge, as many exterminators themselves have a hard time fully ridding stink bugs from premises. Whenever possible try not to use chemical pesticides, as they are harmful to the health of people and other animals. 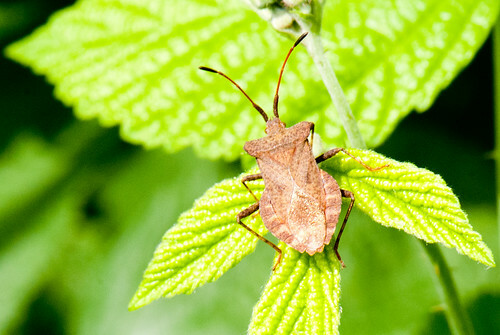 Consider the fact that similar to many other insects stink bugs don’t like garlic and catnip or herbs such as mint and basil. Using one of these you could try and stink out the stink bug. Alternatively diatomaceous earth works well with roaches and ants and could have positive effects here too. Jakob Barry writes for Networx.com. He covers various eco-friendly home improvement topics including eco-friendly mosquito and roach control . Do you have a stink bug problem? How have you gotten rid of the bugs? Have you used the stink bug traps and do they work? Sealed the cracks and the stink bugs can’t get in? Have you killed a stink bug? If so, what was the smell like? Mine look exactly like the picture but I have never smelled anything . Is there another bug out there that looks just like it? The first stink bug I saw this year was in Belle’ s web. Belle is the garden orb who built her home just outside my front door. She loves the pesky pests that I don’t like and she has been here for two months. Now there are two webs just outside my backdoor and that is where I saw the next sink bug. I leave them to do their jobs.